Shop our Products section for some amazing handmade items found in your city or our Events page to find craft fairs, art shows and markets happening close to you. Our maps were put together at the beginning of November and show the number of events happening around Alberta for the months of November and December. The numbers will change as new events are added and as events pass so please be sure to visit our Events page for the most up to date numbers and to find the dates / times / locations for all the different craft fairs, art shows and markets! 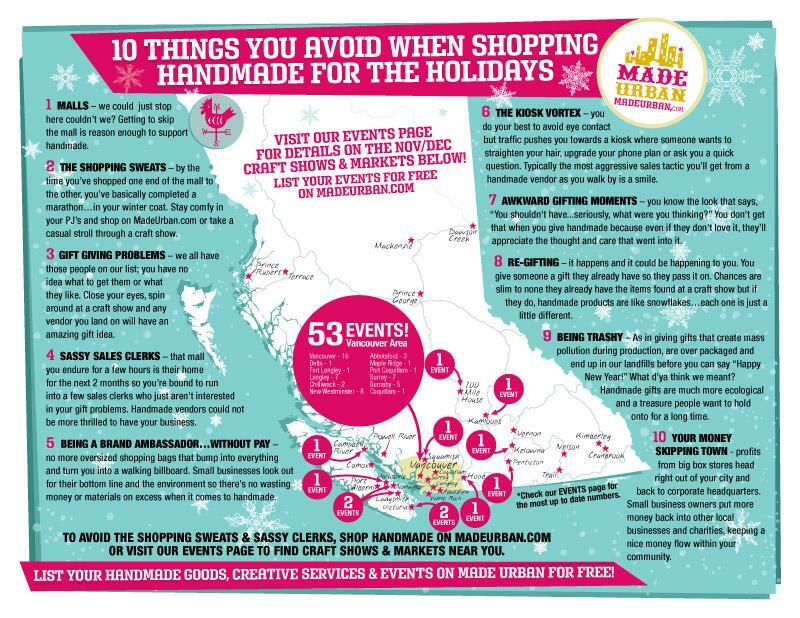 There are a lot of perks to shopping handmade and below are just 10 of the things you get to avoid when shopping handmade for the holidays! We could just stop here couldn’t we? 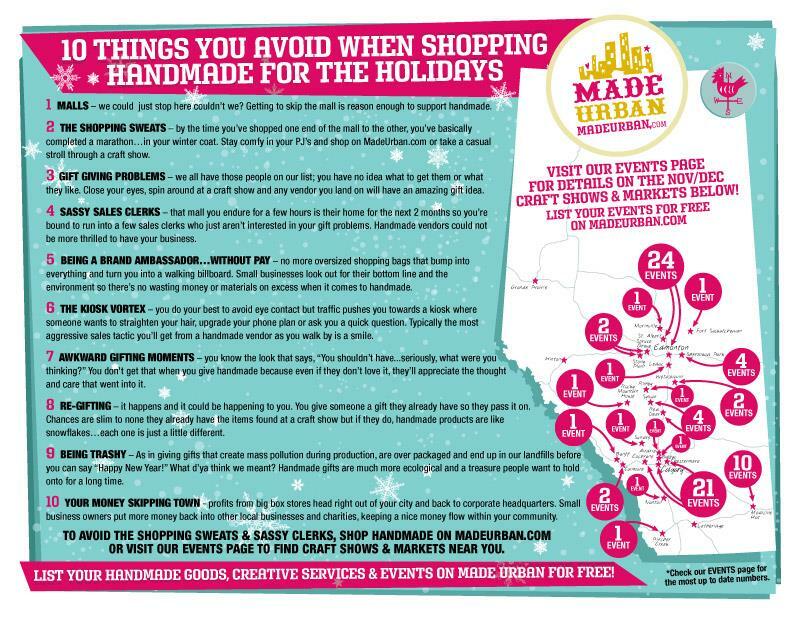 Getting to skip the mall is reason enough to support handmade. By the time you’ve shopped one end of the mall to the other, you’ve basically completed a marathon…in your winter coat. Stay comfy in your PJ’s and shop on MadeUrban.com or take a casual stroll through a craft show. We all have those people on our list; you have no idea what to get them or what they like. Close your eyes, spin around at a craft show and any vendor you land on will have an amazing gift idea. That mall you endure for a few hours is their home for the next 2 months so you’re bound to run into a few sales clerks who just aren’t interested in your gift problems. Handmade vendors could not be more thrilled to have your business. No more over-sized shopping bags that bump into everything and turn you into a walking billboard. Small businesses look out for their bottom line and the environment so there’s no wasting money or materials on excess when it comes to handmade. You do your best to avoid eye contact but traffic pushes you towards a kiosk where someone wants to straighten your hair, upgrade your phone plan or ask you a quick question. Typically the most aggressive sales tactic you’ll get from a handmade vendor as you walk by is a smile. You know the look that says, “You shouldn’t have…seriously, what were you thinking?” You don’t get that when you give handmade because even if they don’t love it, they’ll appreciate the thought and care that went into it. It happens and it could be happening to you. You give someone a gift they already have so they pass it on. Chances are slim to none they already have the items found at a craft show but if they do, handmade products are like snowflakes…each one is just a little different. As in giving gifts that create mass pollution during production, are over packaged and end up in our landfills before you can say “Happy New Year!” What d’ya think we meant? Handmade gifts are much more ecological and a treasure people want to hold onto for a long time. Profits from big box stores head right out of your city and back to corporate headquarters. Small business owners put more money back into other local businesses and charities, keeping a nice money flow within your community. There are more than 10 benefits to shopping handmade…feel free to add your own to the comments section!